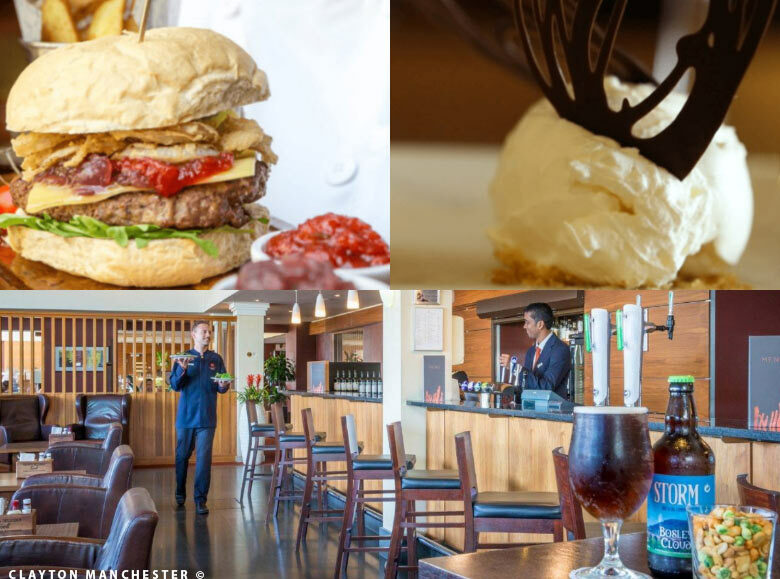 As a wise woman once said: "First we eat, then we do everything else", so why not dine at some of the best Manchester Airport hotel restaurants before you take off? Whether you've got your heart set on a succulent steak or have been craving a zesty Pad Thai, our Manchester Airport Hotels have got you covered. But the million pound question is: which hotel serves the best food? Find out below! Handily situated at the Radisson Blu, the Collage Restaurant is a traditional brasserie that offers a cool twist on British classics. You can dine with fabulous views of both the city and the airport with a glass of wine in hand and a plate full of yumminess. Get your meal off to a great start with the Collage Restaurant's appetising starters, which include: Salt & Pepper Squid with Garlic Aioli, Crispy Chicken Wings, Crab & Avocado on Toasted Sourdough, and Pea, Spinach & Mint Soup. Starters cost between £5.00 - £11.00. If you're a lover of all things beef, you're going to love what's on the menu here! From chargrilled premium English beef steaks (sirloin, fillet, rump and ribeye), to the Blighty Beef Burger and Southern Fried Chicken Fillet Burger, there's something for everyone. The meat mains range in price from £16.00 - £31.00. If beef isn't up your street, you can chomp on other mains such as Prawn & Squid Linguine, Beer-Battered Fish & Chips, and Roast Garlic & Rosemary Chicken. Mains cost between £13.00 - £19.00. Choose from array of desserts, such as Honeycomb Cheesecake, Chocolate Fondant Brownie, Strawberry & Raspberry Eton Mess Sundae, and a Lemon & Ginger Treacle Tart. Even better is that you can get two desserts for £12.00; desserts range from £7.00 - £9.00. Click here to view the full Collage Restaurant menu. The Collage Restaurant can be found at the Radisson Blu Manchester, which is the closest hotel to Terminals 1 and 2; You can walk to T1 in 5 minutes, T2 in 10 minutes, and T3 in 15 minutes. Dining at the Clayton Manchester is a thoroughly enjoyable affair - great grill food right near to Manchester Airport! Choose from the exclusive seasonal A La Carte menu or the more budget-friendly fixed price menu. If you've got kids, this'll be music to your ears - one child (aged 12 and under) dines for free when an adult buys a main course from the A La Carte menu! Begin your meal with a choice of small, tasty dishes which include Cajun Chicken Lollipops, House Parfait & Caramelised Onions, Breaded Whitebait & Smoked Paprika Mayo, and soup of the day. Starters cost between £6.00 - £8.50. For all you meat lovers out there, you will be mightily impressed with the dishes from the Grill, which includes a selection of steaks (fillet, ribeye and sirloin), Lamb Loin Chop, BBQ Spare Ribs & Kaleslaw, Lemon Chicken Breast and Butterfly'd Lamb Rump. All meat grills are served with grilled tomato, rocket, chunky chips, crispy onions and come with a choice of sauces. Grill meats cost between £14.00 - £28.00. If you fancy something other than stuff from the Grill, there is an assortment of alternative mains; enjoy hearty Sea bass with Crushed Potatoes, Spinach Puree & Spring Onion, Duck Breast, Fondant Potato, Roast Carrot, Blackberry & Crispy Quinoa, Linguine Carbonara, and Cheese-Filled Tortellini Cashew & Pine Nut Pesto. There are also a range of salads on offer, including Classic, Crumbled Goats Cheese and Chilli & Garlic Tiger Prawns. Main courses cost between £12.50 - £21.00. Got a sweet tooth? Indulge in the exclusive Clayton Sundae, the Warm Chocolate Fondant or the Sticky Toffee Pudding. Desserts are from £6.50 - £9.00. The Clayton's great value fixed price menu contains a bespoke table d'hote menu where you can eat two courses for £22.00 or three courses for £25.00. All dietary requirements can be adhered to, just let your waiter/waitress know when you order. Click here to view the full Grill Restaurant menu. The Grill Restaurant is located at the Clayton Hotel which is a 2 minute shuttle ride from Terminals 1&3, and a 5 minute shuttle ride from Terminal 2. You can also walk to terminals, it's an 8 minute walk to Terminals 1&3 and a 16 minute walk to Terminal 2. Never short of amazing reviews, Sampans Oriental Restaurant at the Crowne Plaza hotel is overseen by Head Chef Boonta English who grew up in South Thailand. Boonta's inspiration came from watching his Mother cook, and him experiencing the aromas that came from their homegrown ingredients; today, Boonta has mastered Oriental cuisine and creates his own fusion of Sampans dishes. For starters are light soups, such as Prawn Wonton Soup, Spicy Thai Soup with King Prawn, Tomato & Mushrooms, and Spinach & Dumpling Soup. There's also tasty Dim Sum, which comes with both steamed and deep fried options, including Peking Chicken Dumpling, Crispy Prawn Wonton, and Pepper Squid. Aromatic duck is served with pancakes and tempura dishes are also up for grabs. Chef speciality starters are ideal for those of you looking for unique flavours, with dishes such as Grilled Salmon with Sriracha, Lime Juice Marinade & Chilli, and Mussels, Lemongrass, Lime Leaves and Coconut Milk. An average starter costs £7.00. Indulge in the ultimate Asian treats with an extensive array of flavoursome meals with a choice from chicken, duck, meat, seafood and vegetarian. Signature dishes include: Duck Breast with Ginger & Hoisin Sauce, Pak Choi and Pickled Ginger, Shredded Chilli Beef, Kung Po King Prawn with Cashew Nuts & Sweet Chilli Sauce, and Vegetable Pad Thai. Chef specials are: Mild Curry with Soft Shell Crab, Coconut Milk, Spring Onions & Shallots, Thai Jungle Curry with Pork & Oriental Vegetables, and Stir Fried Ginger with Shitake Mushrooms, Chilli & Spring Onions . An average main costs £17.00. Click here to view the full Sampans Oriental menu. 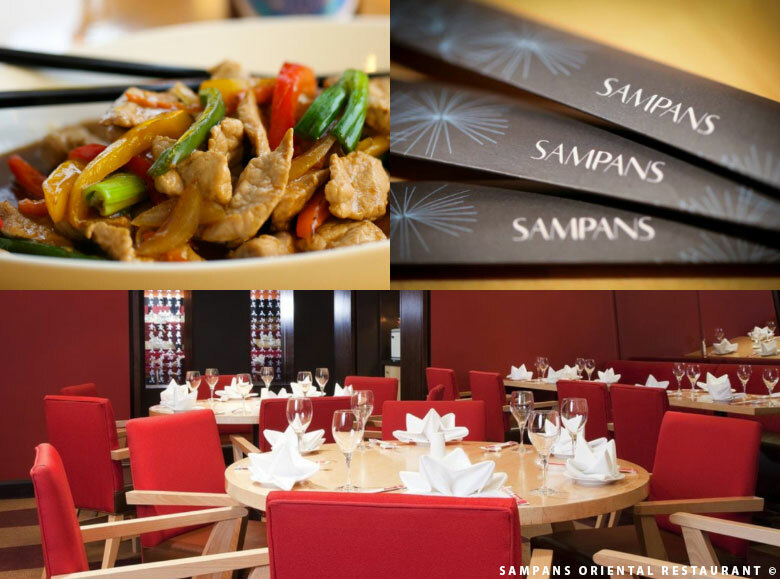 Sampans Oriental Restaurant is located at the Crowne Plaza Manchester Airport, which is a 2 minute shuttle ride from Terminals 1&3, and 4 minutes from Terminal 2. You can also walk to each terminal from here; it's a 6 minute walk to Terminals 1&3, and a 14 minute walk to Terminal 2.